Acne is a common and treatable skin condition that causes pimples or “zits” and other skin problems. About 70-90% of teens (girls and guys) will have some kind of acne breakout. Acne most often occurs on the face, back, and chest; however, you can also have acne on your neck, shoulders, upper arms, and buttocks (bum). Acne is caused by clogged pores (also called hair follicles), which are small openings in the skin through which hair grows. 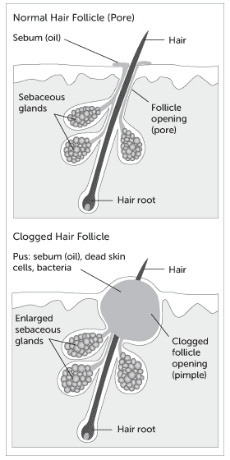 Deep inside each follicle is a hair shaft attached to small glands called “sebaceous glands.” These glands make an oily substance called sebum to moisten our hair and skin. When too much sebum is made, it can mix with dead skin cells (that we are constantly shedding) to create a sticky plug, which clogs the hair follicle. This is very common during the teenage years because of normal changes in hormone levels. Grease-filled air in restaurant kitchens — if you work in this type of environment, be sure to wash your face when you get home. Stress. When you’re emotionally stressed your body makes extra hormones that can cause breakouts. Trapped bacteria grow very fast in plugged hair follicles and make chemicals that can cause swelling, redness, and irritation. Eventually, the plugged follicle can burst and spill everything – oil, dead skin cells, and bacteria – onto the surrounding skin leading to different types of acne–whiteheads, blackheads, pimples, and cysts. Whiteheads are pores that are bulging with dead skin cells and sebum. Blackheads happen when a clogged pore is open and a chemical reaction causes the surface to darken. The blackhead isn’t dirt, so it can’t be washed away. It’s actually caused from a buildup of melanin-a skin pigment. Rubbing the skin or using harsh cleansers can cause further irritation. Pimples occur when a clogged pore becomes infected by bacteria causing a red, raised bump to appear on the skin. Pimples can have a pus-filled top, which is the body’s way of reacting to a bacterial infection. Pimples, also called “zits,” can be tender to the touch. Cysts occur when clogged up pores break under the skin causing bigger and often very painful bumps. If left untreated, these cysts can cause scarring. According to the Academy of Dermatologists (AAD), acne is the most common skin condition in the United States and 85% of young people between the ages of 12 and 24 will experience at least minor acne. Most teens will get acne sometime during their teenage years, because puberty is the time when there are many hormonal changes. Hormones are chemicals that are responsible for all of the physical changes that happen when you go from being a child to an adult. Teens who have a family history of acne (their parents had acne when they were teens) are more likely to get it, but most teens who get acne will be free of it by the time they are young adults. Teen girls often complain of acne just before their periods. The medical term for this is called “premenstrual acne” and it’s usually due to the hormones that are active before your period. Some girls are more sensitive to these hormones than others. So even if you’re careful about taking good care of your skin, chances are you may have a mild to moderate breakout before your period. The good news is that once your period is over the acne usually goes away. Acne is also common in girls who have polycystic ovary syndrome (PCOS). PCOS can cause weight problems, acne, excess hair growth and irregular periods. So check with your health care provider if you have any of the symptoms. Do Over-the-Counter Medicines Work on Acne? Over-the-counter (no prescription is required) acne medicine that contains benzoyl peroxide (such as Clearasil®, ProActiv® and Oxy®), resorcinol, salicylic acid or sulfur often help with mild acne. Each product works slightly differently. Products come in soaps, cleansing pads, creams, gels, or lotions. Acne preparations may cause a rash or redness. Your skin may sting or burn if the medicine is too strong. Stop the acne medicine if you have any side effects. It can take up to 2-3 months of using a product to see an improvement in your acne. Be careful to keep the medicine away from your eyes, mouth, and inside your nose. Don’t scrub acne too hard or use products that dry your skin too much–these will make acne worse. Makeup and foundation that claim to clear acne while making your pimples less visible may just cover them up. Sometimes the ingredients in some kinds of makeup can actually cause pimples. Look for oil-free, “non-comedogenic” products. If you have been taking good care of your skin for at least 2 months (washed it twice a day, avoided products that can clog pores, and tried nonprescription acne medicine) and you don’t see any improvement (pimples aren’t going away), don’t worry—make an appointment with your health care provider or dermatologist (skin specialist) to talk about stronger (prescription) medicine that may be helpful. What About Prescription Medicine for Acne? Your health care provider may prescribe products with benzoyl peroxide, retinoid products such as Retin A®, Differin®, Avita®, Tazorac®, and antibiotics such as tetracycline, erythromycin, minocycline, doxycycline, and trimethoprim-sulfamethoxazole (Bactrim). Benzoyl Peroxide: Health care providers who prescribe this kind of medicine usually tell teens to start out slowly, using it 2-3 times a week and working up to every night. Wash and dry your face completely before applying it. You should use a very small amount - about the size of a pencil eraser. It’s common to have red or dry skin at first. If your skin becomes so dry that it peels, your health care provider will probably tell you to cut down on the number of days a week that you use it. Benzoyl peroxide has a “bleach-like” quality, which means that it may cause white marks on towels, pillowcases, and clothing. Make sure you rinse your face completely after using it so you don’t accidentally bleach any of your clothes! If you are leaving the medication on overnight, sleep on a white pillowcase. Retinoid products: very helpful for mild to moderate acne (whiteheads and blackheads). Apply a thin layer of this medicine after you have gently washed and dried your face. People who use this medicine sometimes say that their acne got slightly worse before it got better. To treat moderate to severe acne (pimples, cysts, and scars), your health care provider may prescribe additional medication. Antibiotics: may be applied directly to your face (lotion or gel) or taken by mouth. In some products, benzoyl peroxide and a topical antibiotic are mixed together. They help treat the bacteria that can cause pimples and cysts. If you’re taking oral antibiotics, follow the instructions on your prescription bottle. Some antibiotics require that you take them on an empty stomach, while other kinds say you can take them any time. If you’re taking oral antibiotics, you may get a vaginal yeast infection. Oral Contraceptive Pills: may be prescribed for moderate to severe acne when over-the-counter and prescription medications don’t work. The hormones in oral contraceptive pills can help stop acne from forming. How is Severe Acne Treated? If your acne doesn’t get better with over-the-counter medicine or the usual prescription medicines, your primary care doctor or dermatologist may consider prescribing Accutane® (the brand name) or Isotretinoin (the generic name). It’s a pill that is swallowed twice a day for about 15-20 weeks. The exact dose will depend on your body weight. Accutane® is reserved for severe acne (the kind that causes scarring) that doesn’t improve with other treatments. Should AVOID THE SUN AND TANNING BEDS. Use 30 SPF sunscreen or higher because of the risk of severe sunburn. That includes tanning beds/booths too! Accutane® and other acne medicine can make your skin burn faster. Sunburns can also make your acne get worse. Should be MONITORED BY THEIR DOCTOR including regular check-ups! Wash your skin twice a day (morning and before bed) with a mild soap-free cleanser such as Purpose®, Basis®, or Neutrogena® to remove oil. Having an acne skin regimen is extremely important if you want to get rid of your spots for good!! Wash your face after you exercise and after sweating as oil builds up and can clog pores. Wash your face well after you come in contact with oils or grease such as working in a fast food restaurant. Use your fingertips and a mild cleanser to wash your face instead of a rough facecloth or sponge. Rinse with cool to warm water (not hot). Wash your hands before touching or rubbing your face and try not to rest your chin, cheek, or forehead on your hand. Just think of all of the things you may have touched during the day with your hands! Breaking this habit may help to clear up most of your problem areas. Wash your hair regularly especially if it’s oily. Oil from your hair can make your face and neck extra oily. Use “oil-free” sunscreen when you know you’ll be outside in the sun. Antibiotics and other acne medicine can make your skin burn faster with sun exposure. Don’t scrub your face or use harsh soaps; you can’t scrub acne away but you can make your acne worse if you are too rough when washing your face. Do not use alcohol-based cleansing products. Products with a high percentage of alcohol can make your skin very dry and irritated. It actually can cause your body to make more oil that can result in more acne. Don’t pick, pop or squeeze pimples or anything on your face no matter how tempting! All that poking can cause more inflammation and possibly leave you with a scar. Do not use moisturizers or sunscreens that have oil in them. Look for a label that says “oil-free” and make sure you use a “facial” moisturizer, not a “body” moisturizer. Keep hair gels, hairspray, and other hair products away from your face as they can clog your pores. Wash your face after you use these products to keep oils away.